Simple yet incredibly tasty, it's a recipe you can easily make for any time of the day. 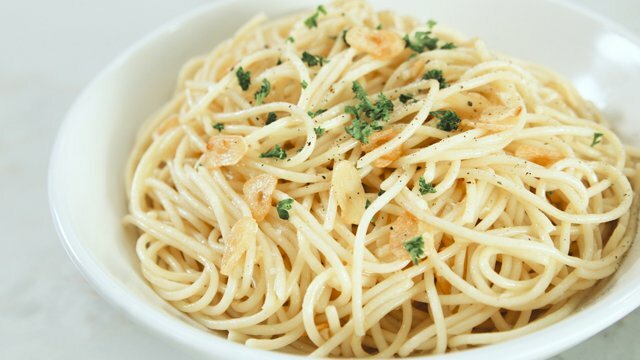 If you love aglio e olio, then you’ll love that this garlic pasta version adds the flavor of shrimp to your favorite pasta. Remember to deglaze to get all the flavor of the shrimp into your pasta dish. Bring a pot of water to a boil. Season with salt and add spaghetti. Stir then let cook 8 minutes. Drain, reserving 1/4 cup pasta water, and keep warm. Meanwhile, in a large pan over low heat, heat oil and add garlic. Gently simmer garlic until it begins to turn golden. Season lightly with salt. Season shrimps with salt and ground pepper. Add shrimps to the pan and cook until opaque on both sides. Add cooked spaghetti and pasta water to the pan and toss to coat. Season to taste with salt and ground black pepper. Serve immediately topped with parsley.